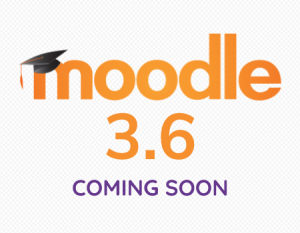 Moodle 3.6 is on the horizon, so to keep you ahead of the curve we’ve taken a look at the most exciting features and improvements in the newest version. As always, If you’d like a more in-depth look at the latest version of Moodle, feel free to contact us for a quick online demonstration. In Moodle 3.6, the ability to handle large numbers of courses and activities will be increased. New blocks which will give easy access to the most recently visited courses and activities. The ability to favourite and hide courses. The ability to load more courses onto one page. The ability to provide a separate timeline block. One-to-one messaging has been a prime feature in Moodle for some time, but with the introduction of 3.6, Moodle will come with the ability to enable group messaging for a course or any other group formed by a teacher. In line with Moodle’s focus on protecting privacy, users will also be given greater control over who is able to message them. A more human-friendly readable format of the data export. The ability to perform an erasure request on previously (prior to Moodle 3.5) deleted users. Improved control over the purpose and retention period for different types of activity modules. Following on from the LTI Advantage support that was introduced in Moodle 3.5, Moodle 3.6 will now introduce support for LTI 1.3. One of the key improvements in LTI 1.3 is enhanced security to protect user information with the introduction of OAuth2 authentication and JSON Web Tokens (JWT) for message signing. The Moodle User Association (MUA) allows users to contribute and select Moodle developments. This time the MUA chose to simplify the way response statistics for random question pools are displayed. Further information can be found on the MUA page and in the tracker. This will allow teachers to upload files and media when providing students with feedback on their work. Inclusiveness for people with disabilities is the driver for this project and current work in this area is focused on improving accessibility of the Boost theme and Forum. Of course this article only covers the highlights of what’s planned – there’s a long list of further tweaks, patches and updates also included in Moodle 3.6. The full list can be found in the Moodle 3.6 release notes over at the Moodle site.